A listing on a German insurance website has revealed all. This week, we learned thanks to a listing on German insurance website HUK24.de. Now, has discovered the same website has inadvertently confirmed the existence of the Mercedes-AMG GT R Roadster as well as its power output several months before the model's official reveal. We already knew a convertible Mercedes-AMG GT R Roadster is coming thanks to, but at least we now know the power output. 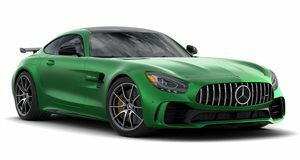 Like its coupe sibling, the Mercedes-AMG GT R Roadster will produce 577 hp from its twin-turbo 4.0-liter V8 engine according to the listing on HUK24. In the GT R Coupe, 0-62 mph takes 3.5 seconds before the car tops out at 197 mph, but the Roadster variant will probably be slightly slower off the line due to the extra weight it will inevitably carry. Previous spy shots have also shown the GT R Roadster will sport a fixed wing instead of a retractable one like the Coupe to keep the car stable at high speed. It will also have an aggressive front fascia with a Panamericana grille, a rear diffuser, and carbon-ceramic brakes, as well as the coupe’s mechanical upgrades such as stiffer suspension, rear-wheel steering, and a limited-slip differential. We still don’t know when the Mercedes-AMG GT R Roadster will officially break cover, but we can rule out the 2019 Detroit Auto Show as AMG has confirmed it won’t be attending the show this month. This means it will likely debut at the 2019 Geneva Motor Show in March. As well as the Roadster, we’re also still waiting for the new GT Black Series to break cover. AMG boss Tobias Moers and will likely be unleashed onto the Nurburgring in the summer before its debut in 2020. Expect it to have more power than the 577-HP GT R, less weight, and a limited production run.